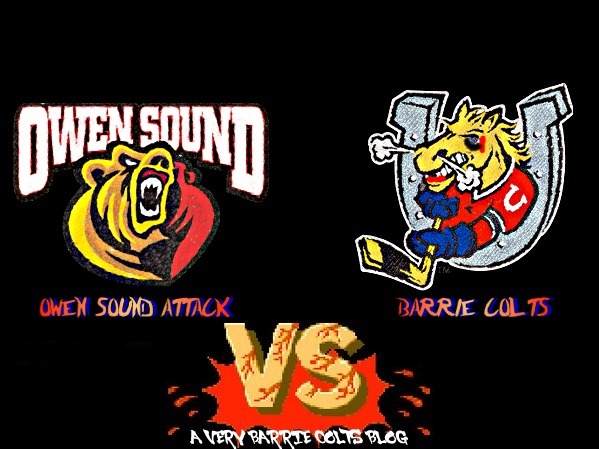 Game Preview: Owen Sound Attack @ Barrie Colts. (The "do we have to?" preview.) - Very Barrie Colts | A website covering the Barrie Colts of the OHL. Tonight the Barrie Colts are home to face the Owen Sound Attack for the fourth of six meetings this regular season. So far, the Attack have dominated the meetings. In the games, Owen Sound has outscored Barrie 19 to 5. Barrie was shutout in one of those games. Both teams met one another in their last outings. Owen Sound had an incredible game! Or, Barrie just had a really bad one.. Can it be both? It can be both. Barrie only generated 29 shots on goal. They went 0 for 2 on the power play and didn't even win half the faceoffs. They were disciplined for the most part only going shorthanded one time, but they allowed a goal. Through the first 7 minutes of regulation, Owen Sound had twice as many goals as Barrie accumulated shots. Christian Propp got the start but was pulled after allowing 4 goals on 18 shots. David Ovsjannikov came in with hopes of turning things around but that never happened. When the team isn't scoring there is only so much good goaltending can do. He allowed 2 goals on 18 shots. Lucas Chiodo scored the only goal for the Colts. The goal was his 10th of the season. He now has 26 points on the season after 31 games. Last season he totaled 10 points (1G:9A) over 50 games played. In a tough season, Chiodo has been a huge positive for the team. Zach Magwood and Ben Hawerchuk both got assists on the goal. Owen Sound has been on a bit of a roll lately. They come into Barrie riding a 3 game win streak and have only lost a few games in the last 10. Barrie, well Barrie has won games before and we will leave it at that. No word yet on on the status of Chicago Blackhawks prospect, Roy Radke but you gotta think he will be back soon. Also, if you din't notice, Nizhnikov returned and played the other night. He was a -2 and got 2 shots on goal. After a huge blowout, will the Colts "insert coin" or will they be a no show?